After investing over $100 million to elect Barack Obama and a pro-union Congress, the American labor movement saw 2009 as a year of historic opportunity. Topping labor’s priorities was passage of the Employee Free Choice Act (EFCA), which would boost union membership by restricting management practices that undermined fair workplace elections. Labor was also primed to pass a strong health care bill, comprehensive immigration reform, and to get a Labor Department that actually cared about protecting workers. Today, labor’s top legislative priorities remain unmet, and EFCA is in limbo. But there is an election this week at California’s Santa Rosa Memorial Hospital (SRMH) that could end labor’s year on a triumphant note. Over 600 workers vote on Thursday and Friday whether to join a union, with a victory potentially paving the way for the unionization of 9000 workers in the St. Joseph’s Health System chain. Management is aggressively opposing the union drive, as is SEIU, which is running a massive media and ground campaign against rival union, NUHW. SEIU’s support is so weak that it informed the NLRB last Thursday that it intended to pull out of the election, only to reverse course the next day so that it could continue its anti-union attacks through this week’s election. While the American labor movement is no longer on the defensive, and clearly has allies friend in President Obama and Labor Secretary Hilda Solis, unions had few legislative gains in 2009. The AFL-CIO selected a new leadership team headed by Richard Trumka, and has won results on some trade and workplace issues, but its top legislative priorities are stymied. Both the AFL-CIO and SEIU ran field campaigns for health care reform, but labor’s impact on the final outcome remains unclear. SEIU followed Obama’s inauguration speech by putting its third largest local, SEIU-UHW, in trusteeship. SEIU has since devoted far more resources battling against the former staffers and worker supporters of this local (now in NUHW) than in organizing new workers. SEIU also got distracted in April when it launched an all-out attack on its former close ally, UNITE HERE. This also squandered resources that should have gone elsewhere, and isolated SEIU from other unions, as labor leaders lined up to publicly support UNITE HERE against SEIU raids. Andy Stern has little to show from his fight with John Wilhelm and UNITE HERE, and SEIU’s absorption of locals affiliated with the pre-merger UNITE has been a financial drain. Unfortunately, the SEIU-UNITE HERE struggle divided the labor movement at a time when unity was essential to pass EFCA and other measures. But SEIU’s President does hope to end the year on a winning note by preventing workers at Santa Rosa Memorial Hospital (SRMH) from unionizing. Unfortunately, the rest of the labor movement will likely see this as a defeat, both for that hospital’s workers and for future efforts to unionize the 9000 other non-union workers in the St. Joseph’s Health System’s chain. 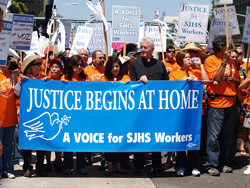 SEIU has pulled out all stops in Santa Rosa because it fears than an NUHW victory will open the door for its rival to organize the remaining 9000 workers in the St. Joseph’s chain. An NUHW victory also gives it more resources and momentum to compete with SEIU at Kaiser Hospital and in other elections next year. But the union has paid a steep price for its struggles against UNITE HERE, and against efforts by SRMH workers to join a union. In recent months, SEIU has gotten in fights with Labor Councils in the North Bay, San Francisco, and Los Angeles, and even threatened the state’s leading labor hero, California Democratic Party Chair John Burton. After preventing NUHW from winning a major victory throughout 2009, SEIU does not want to see its rival enter 2010 with a full head of steam by winning in Santa Rosa. With the Democratic Party needing union money and volunteers for the November 2010 elections, it will have to start delivering for labor soon. This means that Congress will enact some changes in union election rules, though expedited elections rather than card check appears to be where the debate is headed. The type of management harassment of workers occurring at SRMH will clearly be prohibited, and expedited NLRB processing, increased penalties for violations, and other reforms will be part of the final legislation. Expect the labor movement to take a much harder line with the Obama Administration on immigration reform than they have on other legislative issues. After 2009, next year for organized labor can only be an improvement.